West Tyson Parking Lot: From St. Louis, take I-44 west to the Lewis Road Exit and turn north. At the stop sign, turn west onto the outer road, go about 100 yards to the entrance, then turn right into the park. Then turn right on the park service road and follow to the small paved lot at the end. You may park anywhere as long as you aren’t blocking roads or gates. You may also pull off onto the grass if it is not muddy. Lone Elk Trailhead Lot: From St. Louis, I-44 west to Hwy 141. Turn right and immediately right again, following the sign for Lone Elk Park. At the stop sign, turn left on the north outer road and follow the road along I-44 and then around a sharp right curve. Approx. a half mile further there is a half-circle pull-off and gravel lot on the right. 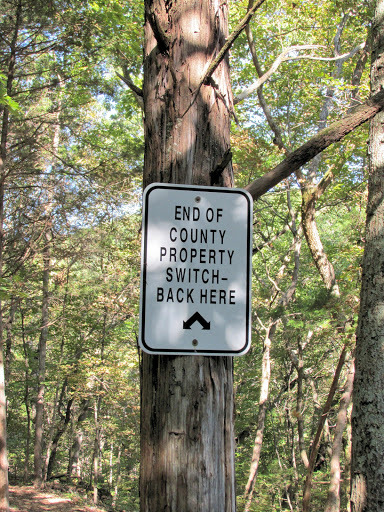 To access Chubb Trail, ride about 2 miles north along the park road until it forks at gates going into the elk area. Chubb Trail is on the right side of the gates along the fence, signed with a white tree on blue. If you have a smaller trailer, you can continue past this lot to the Chubb Trailhead. From Eureka, take I-44 east to Hwy 141, turn left, and immediately get in the far right lane. Turn right just after going under I-44 and follow directions above. Very Limited. There is no official parking area for horse trailers so all the lots are very small. You are no longer allowed to park at the small circle drive at the beginning of the Chubb Trail. Not allowed and not feasible. The trail is narrow single track and very rough. There are no roads available here. 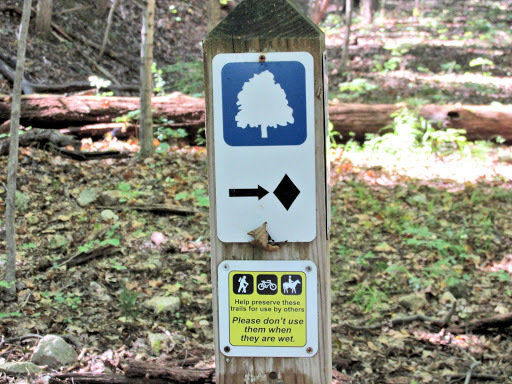 All the trails in the park are now open to equestrians, not just the Chubb Trail. 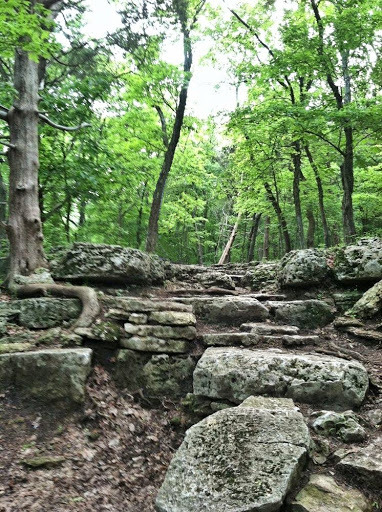 This trail system has a wide variety of terrain, from rocky and steep trails to sandy trails. This park is in a suburban area and is loved by mountain bike riders so expect to run into a lot of them, especially on the weekends. 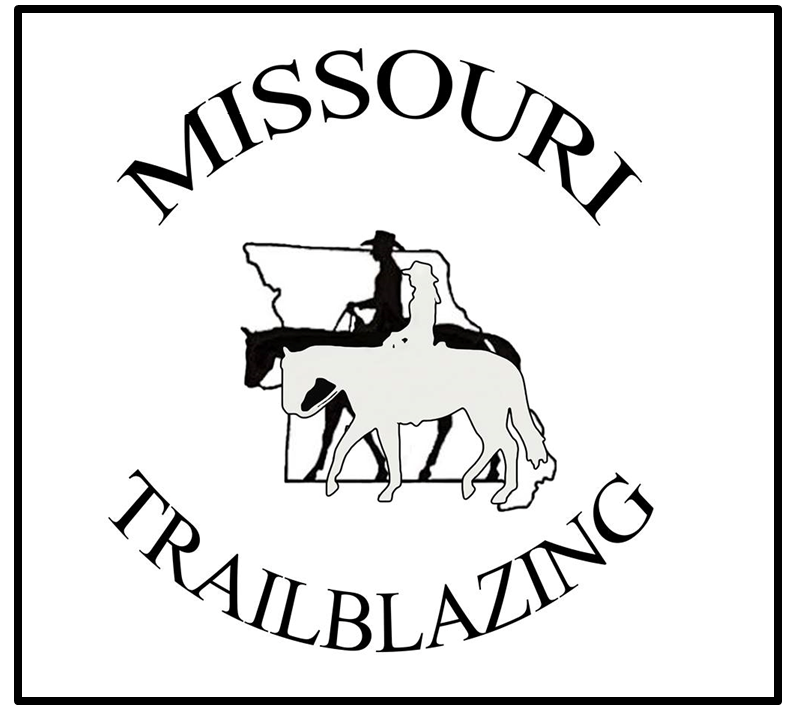 Chubb Trail: (7 miles one way, 14 miles out and back) This trail starts in West Tyson Park, goes through Castlewood State Park, then extends into Lone Elk Park. 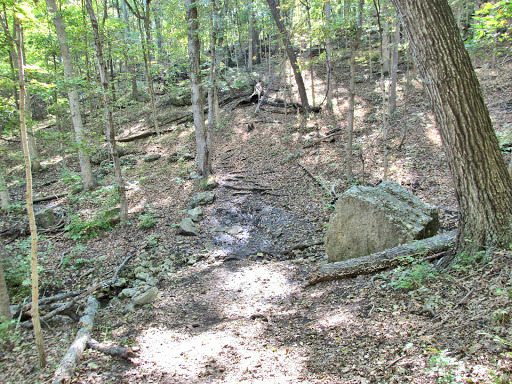 This trail is rocky and hilly, and includes a set of step-like ledges that can get slick. It goes under and along side an active railroad track, so you might encounter a train. 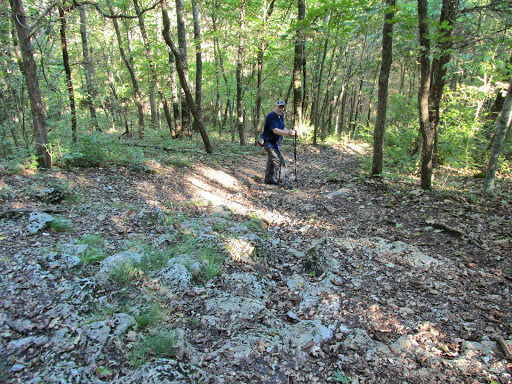 After you leave the Castlewood Loop, it’s a long gradual climb up to the small parking lot at the end of the trail in Lone Elk Park. 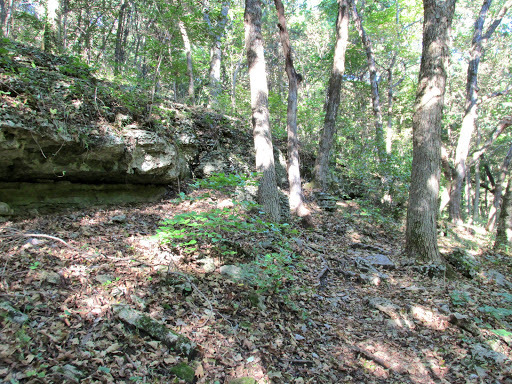 Castlewood Loop Trail: (2.8 miles) Can only be accessed from the Chubb Trail. 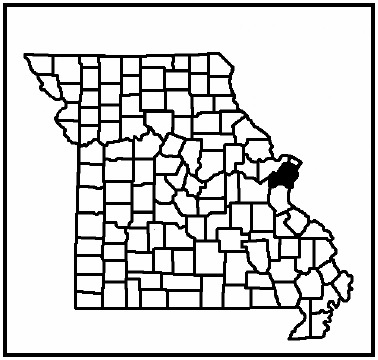 It is technically located in Castlewood State Park, but across the river from the main part of the park and it’s other trails. 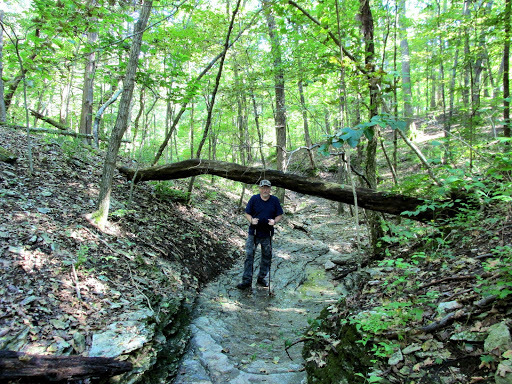 This trail is mostly level and very sandy where it runs through the river bottoms area. This area can flood during the rainy season. There is both a high and low water route. 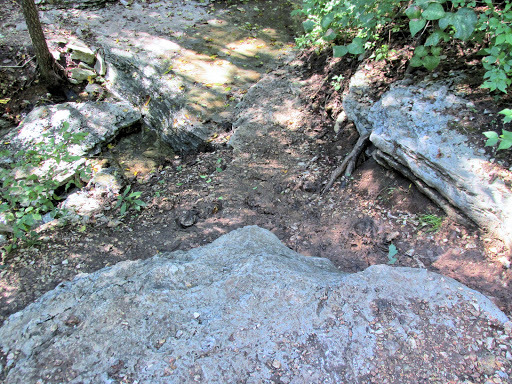 This trail can get confusing as the trail often gets washed away, and there is a lot of various side trails going to the river. 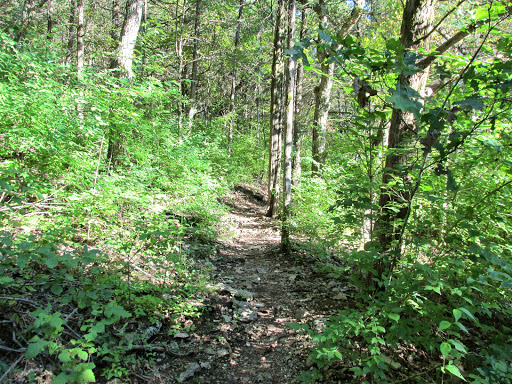 Prairie Loop Trails: (1.5 miles) Mostly level trails that also go along the sides of open grassy areas. 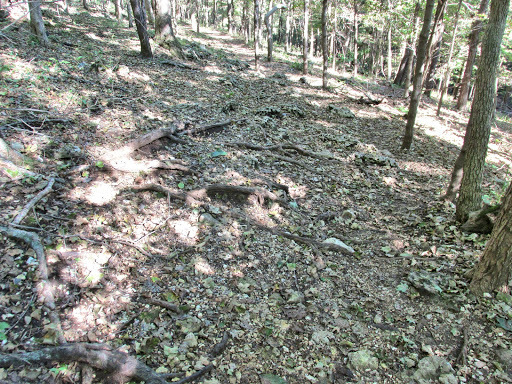 These trails are close enough to the river that they can become flooded at times. 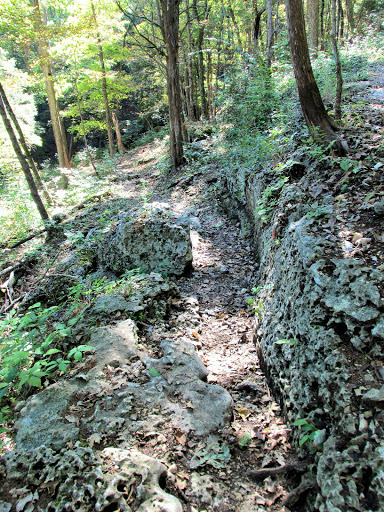 Flint Quarry Trail: (3 mile loop) Single Track, rough and rocky. There is an overlook with a bench in the northeast area of the loop. 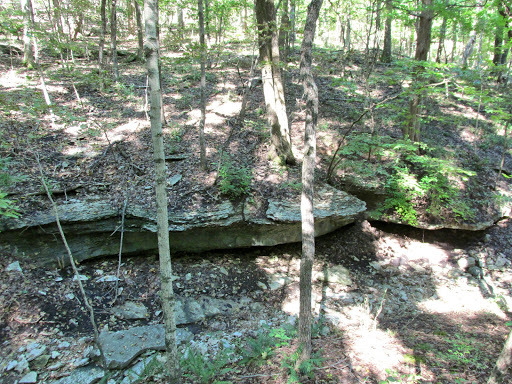 There is a really neat rocky ledge that you ride along for a while. 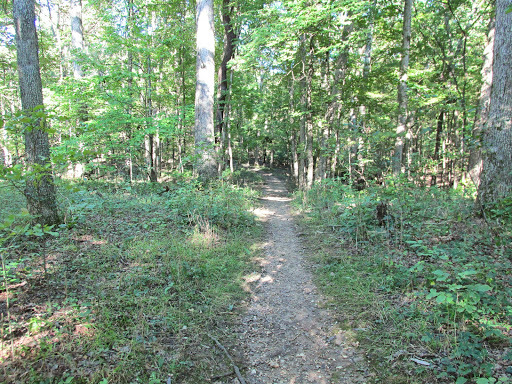 Connector Trail: (.5 of a mile) This trail connects the Flint Quarry Trailhead to the Chubb Trailhead. It goes in and out of creekbeds, and when we were there, a large tree trunk was down over the trail and creek that would be almost impossible to ride under, you’d have to 4-hoof it through the woods around it. There was no official re-route that we could see while we were there. 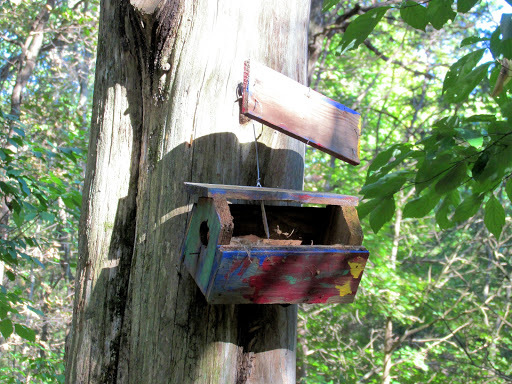 Hiking, picnicking, & mountain bike riding. 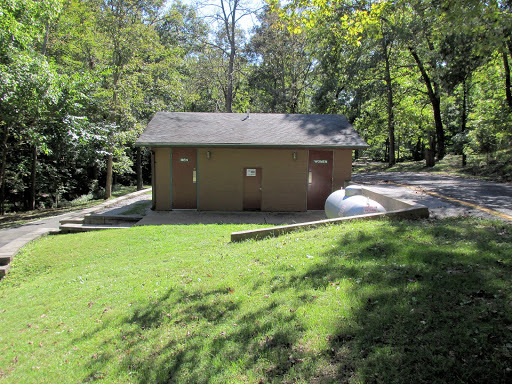 Toilet facilities, pavilion, bar-b-que pit, trash cans, & picnic tables at West Tyson. None at Lone Elk. Drinking Water: Available at West Tyson. Water for horses: Available at West Tyson. Car care, groceries, & a restaurant: Eureka, right there. *Always call 911 for emergency assistance first. Tree down over creekbed trail. Too low to ride under, would have to ride around. 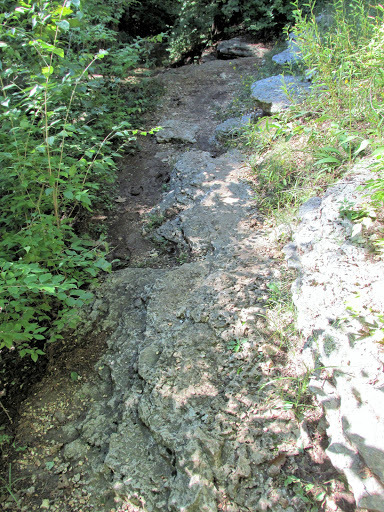 Lots of bedrock showing through along the trail tread. 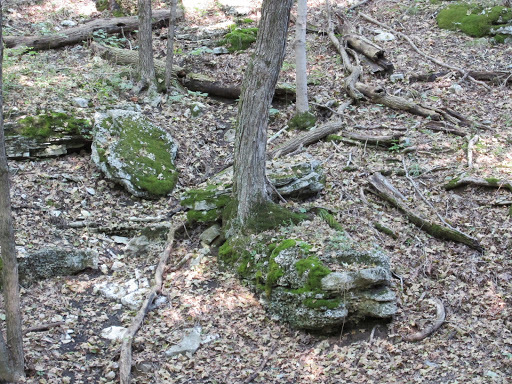 Several trees that look like they’re growing out of or around rocks. Lots of rock ledges to go by. 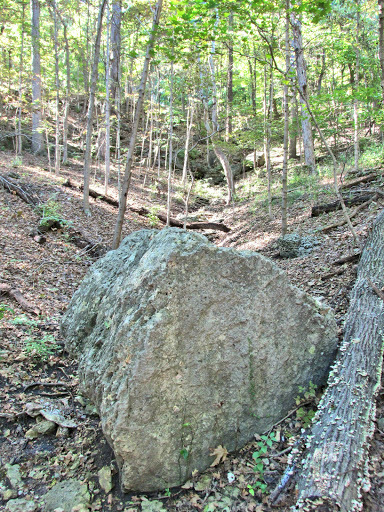 A few huge boulders scattered along the trail. This one was chin high on me. Looking back down the hill at the boulder, you can see the trail has a muddy spot. There were muddy places here and there even though it hadn’t rain in a long time. 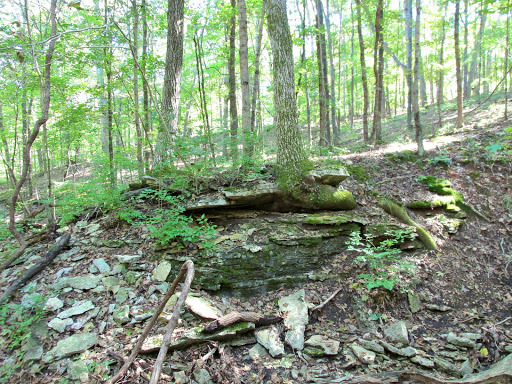 Lots of exposed roots, as well as rocks, on the trail to trip you up. 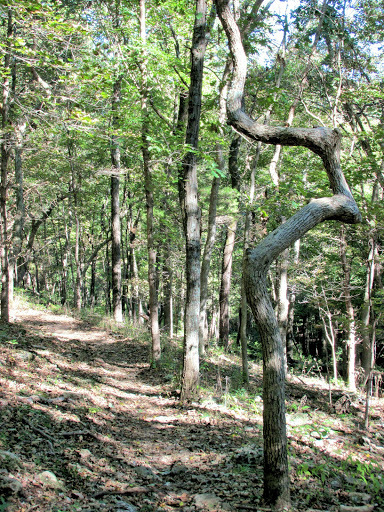 Funny shaped tree along side of trail. like it says to stay on the trail. This narrow passage through the rocks is just past the sign. pony Haffy through. It’s also going downhill at the same time. you’d have to go up a tiny steep rocky hill and turn left here. Another tree that looks like it’s growing out of a rock. 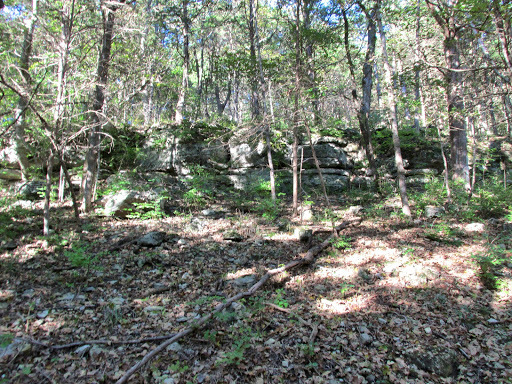 A short section that is more overgrown looking. 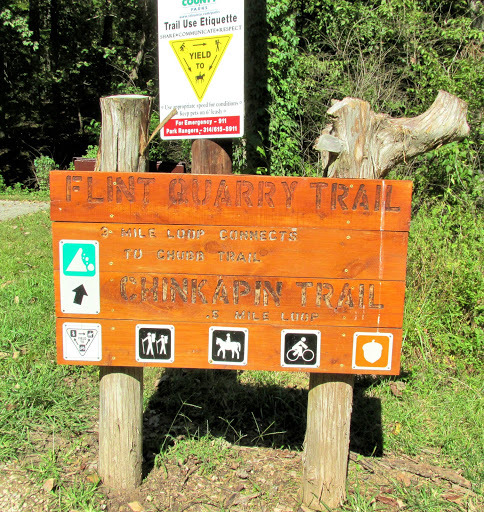 at the Flint Quarry Trailhead in a short distance. and fun to maneuver if you like a challenge and trust your horse. 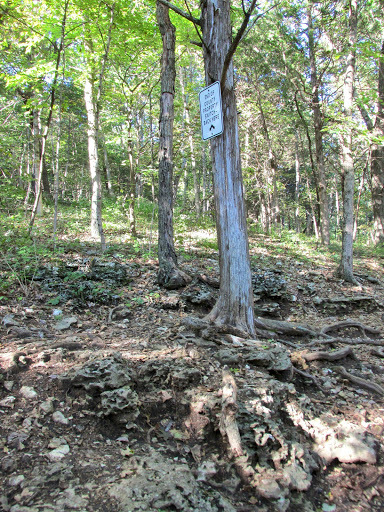 This is the steep hill of Flint Quarry Trail, just after the turn. You can tell it’s steep in this picture, but it still looks even steeper in real life. 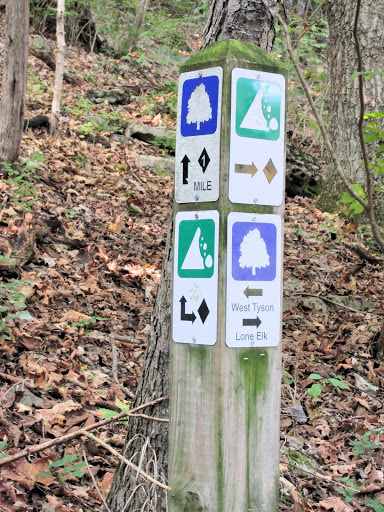 follow the rest of the way to the trailhead lot. gets right next to it. Coming to the end of the bluff. time, but has seen better days. Hopefully someone will replace it with a new one.